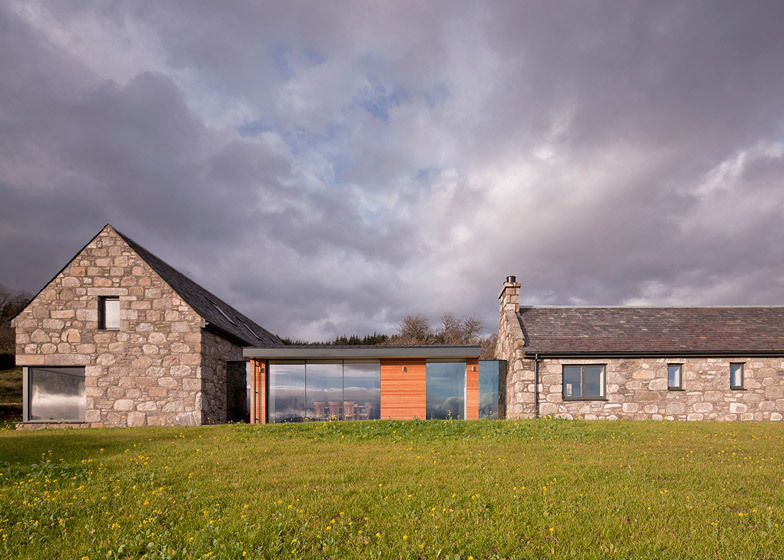 A modern timber and glass structure connects the more traditional stone-walled buildings at either end of this house in the Scottish highlands, designed by architects Stuart Archer and Liz Marinko (+ slideshow). 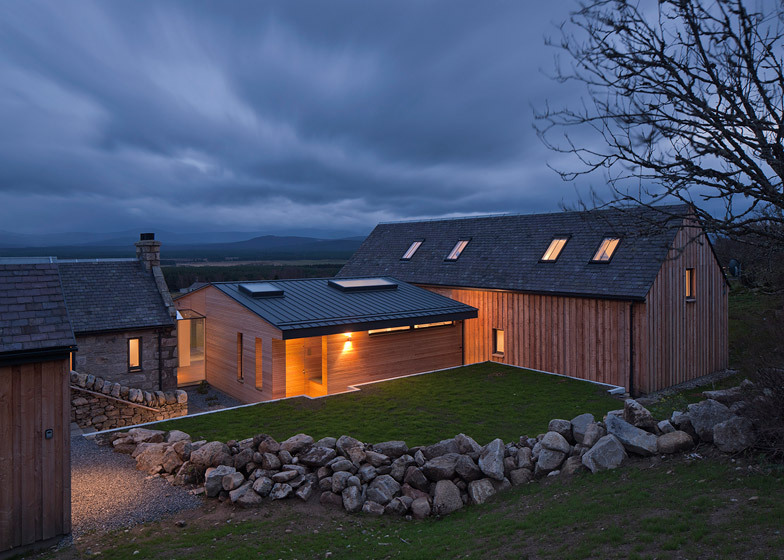 The property for a single occupant replaces a derelict cottage and farm building on a hillside site within a conservation area in the Spey Valley. The Gaelic word Tor – meaning a rock or piles of rocks on top of a hill – gave the project its name, Torispardon. The footprint, massing and materials of the original buildings were recreated in the two new stone-walled structures, while the linking middle section offers a contemporary counterpoint. "Farmer's crofts in the highlands often have several outbuildings within their boundaries; as a farm expands or requires new facilities, a new outbuilding is constructed," explained Archer and Marinko. "Instead of creating a new singular house it was felt that this additive approach was more appropriate." 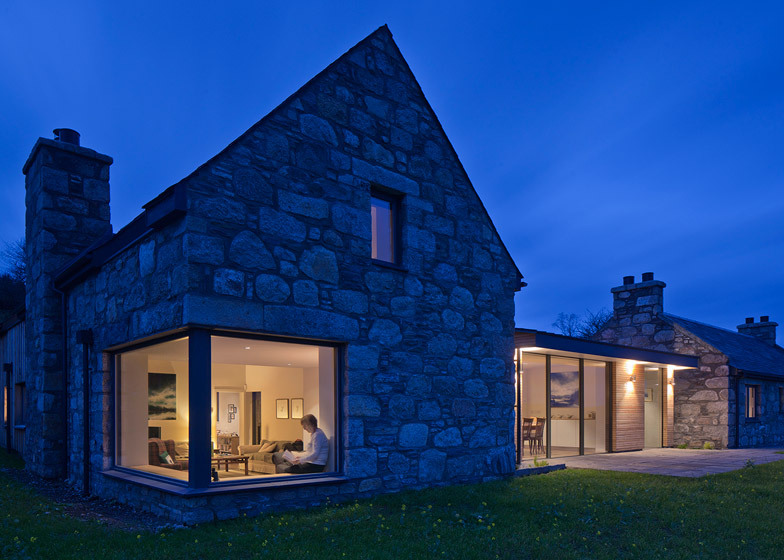 "The cottage and steading reference the traditional local stone vernacular, while the link building is contemporary in form yet deliberately subservient to the other structures," they added. Glass boxes inserted between the three blocks enhance the sense of separation between them. "Frameless glass elements tie the buildings together physically while allowing the three structures to remain visually separate," said the architects. Local masons used reclaimed granite and whinstone from the original buildings to construct the solid external walls of their replacements. 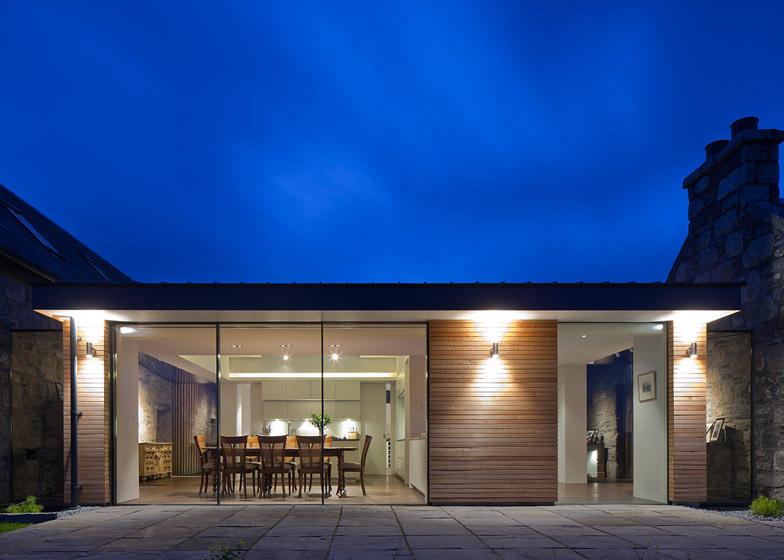 The high thermal mass of these materials allows the building to absorb and release heat slowly, helping to maintain an even internal temperature. At the rear of the steading – the larger of the two stone blocks – local larch is applied in a traditional vertical board-on-board style and is intended to evoke nearby agricultural architecture. Larch is also used for the linking structure, but in this case narrow planks of a denser Siberian species create a more contemporary aesthetic. "The materiality of the project is key," explained the architects. "Whilst it was important to use local materials for sustainable and aesthetic reasons, the building's forms and material choices were also a result of the project's location." 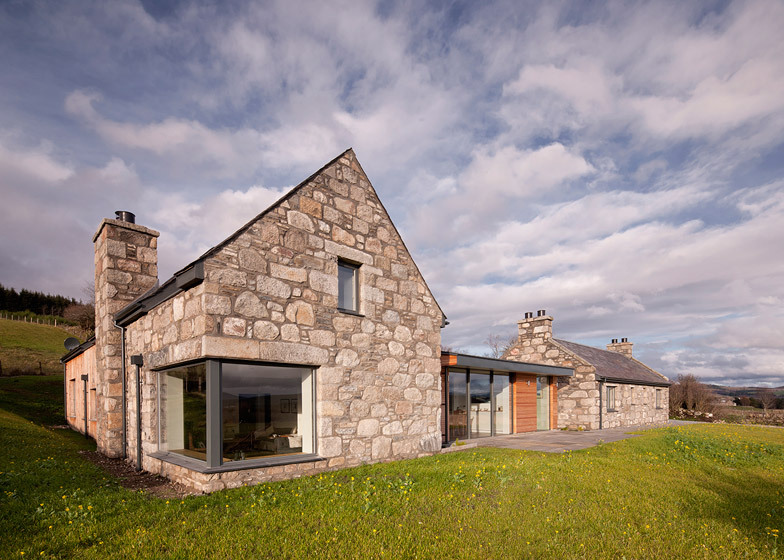 "The glazing was also equally important; from the chunky painted timber windows of the steading and cottage, to the frameless Swiss sliding door system, the concept was to carefully select and maximise the views of the project's beautiful surroundings," they added. The client asked for a home suitable that is suitable for solitary living but can also accommodate large parties, so the cottage includes rooms for guests that can be closed off from the rest of the property when not in use. An entrance at the rear of the building leads into the linking structure, which features a steel frame reminiscent of barn buildings. 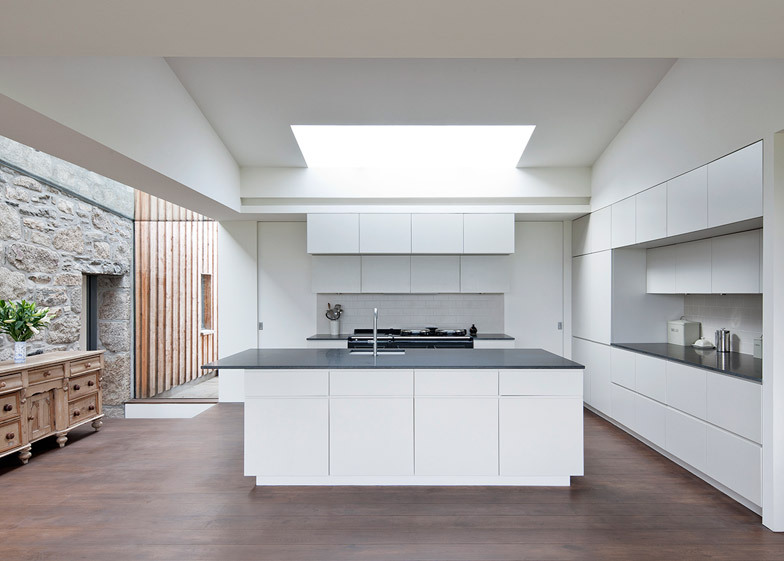 This open-plan space houses a kitchen and dining area flanked by glazing. Skylights and the glass walkway bridging the gap between the buildings fill the room with natural light. The steading is partly sunken into the sloping site and is accessed by short sets of steps from the kitchen that lead to the living area. This double-height room features a mezzanine snug tucked beneath the vaulted ceiling and a corner window with deep reveals lined in oak, providing a perch for gazing out across the landscape. The master bedroom can be found beyond the living area in the timber section of the building and boasts a dressing room and en-suite. A staircase leads from the bedroom to a first floor study and balcony.